There’s no shortage of talk among marketers and brand strategists about viral content. Yet, most people miss the most important ingredient in viral content. The reason? It’s complicated. It’s not for lack of trying. Bloggers have authored list after list of the steps to reach Internet fame. Marketing researchers have even taken to sweeping demographic surveys to try to get to the bottom of things. Our desire to learn that “one easy trick” to gaining attention and influence isn’t a product of the Internet age. We have a deeply ingrained desire for external validation of both ourselves and our ideas. What has changed is the ways we seek attention and influence as well as what we hope to gain from it. In a recent interview Founder Jonah Peretti explained how BuzzFeed started out as a tech company, not a media production business. Their first goal was to understand how content spread across the web, not to produce their own content. The early BuzzFeed blog was essentially a proving ground where observations and theories on viral sharing were put to the test. With its success, it’s clear now that BuzzFeed really got to the heart of understanding viral content. But what’s this amazing secret to virality? Here’s the secret: People share something when the act of sharing it helps them communicate something about themselves. That’s it. Not so hard is it? It’s about demonstrating connection to or distance from a piece of content, an idea, an action, or a belief. The sharing reader cares about being seen publicly approving or disapproving of something enough to take action—albeit with a mouse click or finger swipe. It’s about showing other people that they like something whimsical or something that touches on a hidden part of their inner person, matches their sense of humor, or brings them into a closer relationship with a friend or association with a group. Sometimes it’s about being seen in a curatorial role. They share or promote things they want to be seen publicly sharing or promoting—things that add value and dimension to their self-concept. Social sharing is a form of communication—with the somewhat narcissistic twist of hoping to get some intangible benefit in return. Not so easy now, is it? Because the question you start asking is: How do you measure such an idea? How do you make a piece of content do that? The reality you have to face as a content producer is that not every idea has the potential to go viral. It might be really valuable for you to promote a certain piece of web content or advertise a particular event to a core audience, but you have to face the reality that a lot of that content isn’t of particular interest to a wider Internet audience. That’s okay! You can’t please all the people all the time, as they say. This gives you the opportunity to focus on who you can impact with your content and message. Or, if it’s really that important to you, you’ve got to be willing to shape your content to be dramatic and distinct by following some of the more talked about viral marketing guidelines. Potato Salad Kickstarter: The image that raised $55,492. Famed Internet cat Maru in his natural environment. 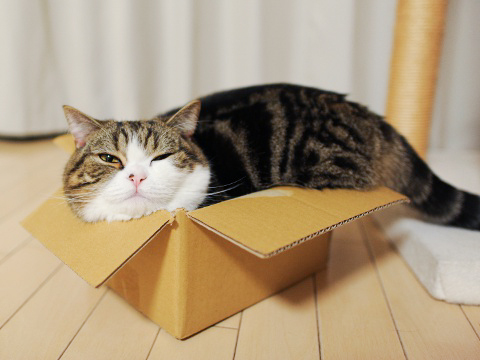 Maru’s penchant for boxes isn’t all that uncommon among cats with showy personalities, but timing played an important part making him famous. Subsequent Internet famous felines have become famous more for a peculiar look (Grumpy Cat, Lil’ Bub, Colonel Meow, Princess Monster Truck) than their everyday cat activities. How many times has Business Insider or Glassdoor published a post that warns against mixing business and R-rated language? (Or for that matter PG-13-rated language?) More times than I care to go back and count. There are good intentions behind this concern. We don’t want to offend customers or stockholders or executives—unless they’d like you to cut the crap and give it to them straight. Being clear and direct is key to having a piece of content that is sharable. When you add in authenticity and personality—another necessary ingredient—things can get rough around the edges. Dollar Shave Club Founder Mike Dubin’s opening pitch in this viral YouTube vid is an excellent example of using R-rated language to establish trust with the target audience. I don’t know that it’s always been this way. It was likely easier a few years ago to share content that had zero likelihood of offending anyone. But web audiences mature fast. Being so banal as to avoid the possibility of offending anyone has a high probability of impressing no one. Think back your target audience. You don’t want to offend them, but that doesn’t mean you can’t connect with them by creating content which might get you a disapproving look from their great grandmother. That’s ok. Your audience isn’t the great grandmother. Not all viral content is entertainment. Some is artistic, some is shocking, some is heartwarming, some is bizarre. But for brands hoping to create viral content, this idea is a must. Everyone went justifiably nuts over Tiny Hamsters Eating Tiny Burritos. The Internet loves small animals. The Internet loves animals doing anthropomorphic things. Most of America loves burritos. The results were around two million views in 48 hours and nearly seven million views in 72 hours. The point? This video was made by a viral marketing agency to demonstrate that they do exceptionally good viral marketing. So they demonstrate expertise, gain brand awareness, likely gain new or renewed business, and entertain millions. Yet the reason the video did well is a focus only on entertaining. All the business goals are besides the point, focusing on those would’ve diminished the impact of the video exponentially. Maybe this is why youth culture does so well producing their own viral content—that practiced façade of not caring or trying too hard, even when they do! As a fan of this idea/product/project, what do I want to say about myself by sharing this content? What do I want other people to think about me or see in me when I share this content? Answer those questions and then build content with those sharing goals at the forefront of your mind. So there you have it. But just in case you needed to see it all tied together, how do all the examples I brought up relate back to this secret to viral content? Let’s take a look. Potato Salad Kickstarter: Initially, shared to demonstrate the sharing reader’s sense of humor, but later took on an element of group association, with the sharer showing they get the joke that seems to be making the other half the Internet unduly pissed off. The Million Dollar Homepage: Even though I’ve only given a passing allusion to this decade-old project, similar psychological forces are at work. Sharers of this content would’ve been interested in grouped association with cutting edge advertising, being a curator of novel web happenings, or perhaps even being seen as disapproving of one of the first strange commercialized web gimmicks of the early 2000s. Sharers can frame the share of the content positively or negatively. Maru: Internet cat content typically has some element of group association with other cat owners, sharing to remind others of their affinity for cats. This is also the reason the web is ruled by cat pictures. Dog owners can take their dogs with them and interact live with other dog owners. Cat owners are stuck at home with their cats, and for good reason—a cat park would be a disastrous. Grumpy Cat, etc. : Similar to Maru sharers, peculiar-looking cat sharers might also pride themselves as being seen knowing about the next new animal star before others. Dollar Shave Club: The sharers of this content are likely to be young men showing affinity for a novel solution to a universal pain point (the untenably high price of replacement razor blades) as well as sharing the content with other male friends with whom they may have discussed this very issue. Tiny Hamsters: These sharers demonstrate their sense of humor and affinity for small animals doing anthropomorphic activities, also burritos. Bonus: BuzzFeed is such a unique company in the Internet environment. There’s not really anything else like it, meaning there’s a lot to gain from reading up on them. I like this great Medium longread interview by Felix Salmon with BuzzFeed’s Jonah Peretti. Bonus 2: The Buffer Blog often has wonderfully insightful content on all things social. A post last month about the psychology behind our Twitter favorites, retweets, and follows seems appropriate to include here as well. Topher Levin is a writer and social media professional based in Overland Park, Kansas.